Have you ever worried your home may be too humid? A typical home in Florida should have a humidity level somewhere between 25 to 50 percent. If your home’s humidity level it too high or too low, your family, yourself, your wallet, and your home may be at risk for some unpleasant and damaging consequences. High humidity levels can affect your overall health. 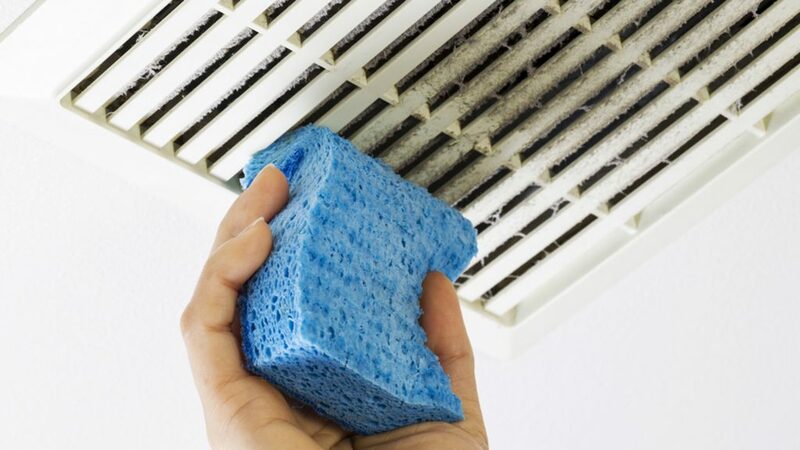 Pollutants such as mold, bacteria, and fungi can cause symptoms such as sneezing, nasal congestion, coughing, throat irritation, and watery eyes. These pollutants can also be toxic and can cause more severe responses such as asthma attacks and allergic reactions. Not only is high humidity in your house an issue, but if your humidity levels are too low, it can lead to problems like nosebleeds, skin irritations, and breathing difficulties. As far as your wallet and home go, inappropriate humidity levels can cause your home to feel hotter than it actually is. Naturally, you will be bumping that thermostat lower and lower, which will increase your utility bill. Excessive moisture can cause damage to the structure of your house. It can damage drywall and wood fixtures in your home causing them to rot, mold, or warp overtime. If you’re unsure about your home’s humidity levels, you can purchase a hygrometer. This is an instrument that allows you to measure your home’s humidity levels. If the hygrometer tells you that the humidity level in your house is not in the ideal range, a humidifier or a dehumidifier will be the starting solution to this issue. Humidifiers are used when the humidity levels are too low in your house. They come in both portable units that can be moved from room to room or you can purchase a humidistat (or hydrostat). A humidistat will monitor your home’s levels and if it drops too low, the humidistat will help restore and sustain the desired humidity level. Dehumidifiers are used to help with humidity levels that are too high. Dehumidistats are devices that detect the moisture level of air in your home. They will be set to an optimal humidity range and when the humidity rises above that range, the dehumidistat will automatically turn on and get the levels back to the normal range. 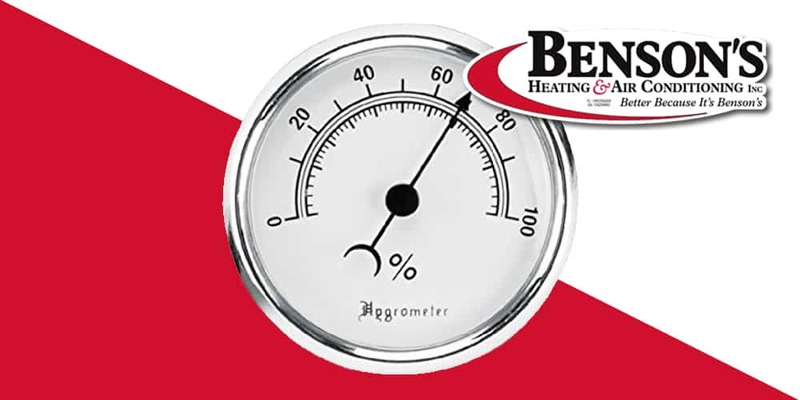 If you are having issues with your humidity levels in your home, give Benson’s Heating & Air Conditioning a call today! We will come out to evaluate the problem and recommend the best way to fix it! Hurricane season is no stranger to us here in Florida. We all probably have a checklist that we go through annually as June approaches that reminds us of the basic preparations that need to be made and what items we need to stock up on in order to survive hurricane season. One thing you may not have thought to add to that checklist is to make sure your home HVAC system is prepared for the storm. Not only does preparing your HVAC system for a storm important to help reduce the likelihood for any damage to the system, but it also helps keep you and your family safe. 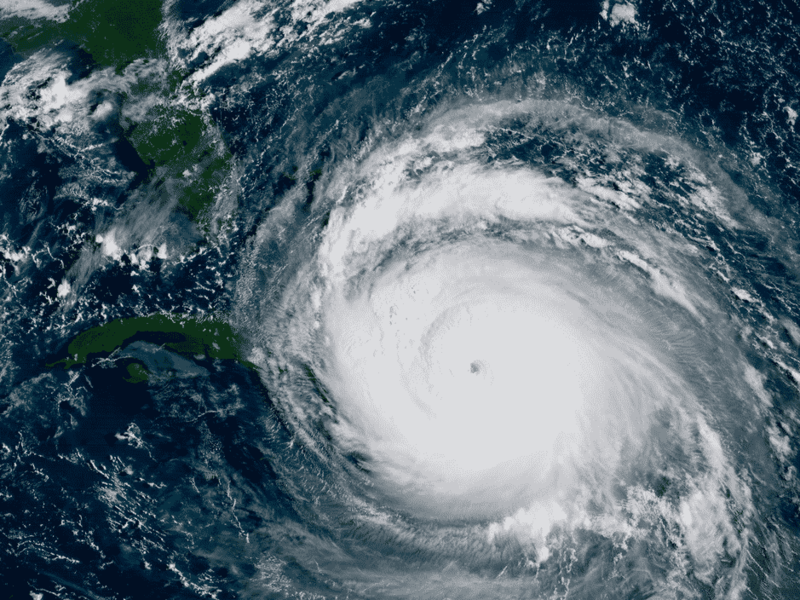 Since hurricanes and large thunderstorms bring on high probabilities of power outages, the first thing we recommend doing when bad weather is heading your way is to cool your home before the storm hits. Turn your AC down a few degrees lower than you normally keep it and keep all of the blinds, doors, and windows closed as much as possible. As the storm gets closer, turn off the electricity or unplug your unit altogether in order to prevent damage through electrical surges from lightning strikes. Another important step when preparing your AC Unit for hurricanes and stormy weather is to secure your outdoor unit by checking to make sure all of the bolts are tightened on the unit. Due to the high winds of these storms, AC units can be easily lifted. Making sure your unit is strapped down with hurricane or condenser straps is recommended to avoid this. If you feel that flooding will be a threat from the storm headed your way, it may be necessary to elevate your unit slightly higher than it normally sits to avoid water damage. Lastly, make sure to bring in or secure any outdoor equipment that could fly away. Also, be sure to cover your AC unit with a tarp or plywood to protect it from flying debris like tree limbs, branches, or any other potentially hazardous objects in your nearby area. Remember, just because you’ve prepped your yard for a hurricane, does not mean your neighbor has. 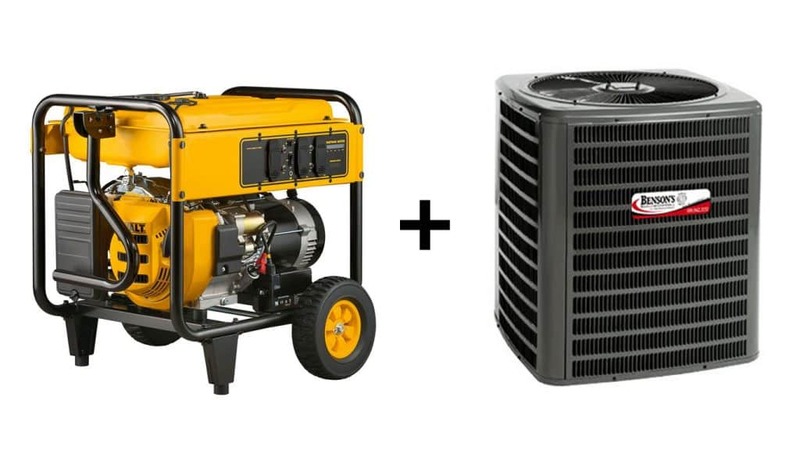 After the storm, the main thing to remember is that you should not turn your air conditioning back on until you have assessed your AC unit for damage from high winds, water, or debris. If you have found any damage or you are unsure if there is a problem, call Benson’s Heating & Air Conditioning and we’ll be happy to come out and inspect and repair any damage to your unit! Imagine being out in the summer’s sun all day, somewhere like Arizona or Florida. After being out all day, the only thing on your mind is to get home and cool off. But wait, as soon you get home, there air is just as hot as it was outside. The heat we can experience in places such as these provide risks for our health. Before the 1960’s, this was what life was like. Now, thanks to air conditioning, 87 percent of American households feel a lot more comfortable and relaxed. In the 1840’s Dr. John Gorrie from Florida wanted to do something about the humidity and heat in buildings. He was an inventor and a physician, so his goal was to provide a comfortable environment for his patients to be in. He believed in “the evils of high temperatures”, and created the first ice maker by using a compressor that could be powered by a horse, water, or steam. His funder for the idea died, so the project was out the window. However, the foundation and idea for modern air conditioning was set into place. In 1902 a man by the name of Willis Carrier, who worked at the Buffalo Forge Company, was assigned to solve an issue of humidity that occured at a textile factory. Carrier succeed and created a system that was able to humidify or dehumidify a room, which was followed by an automated system to control the air. In the 1920’s, Hollywood movies rolled out and theaters needed air conditioning. The idea of air conditioning worked, however the flow of air was inefficient. 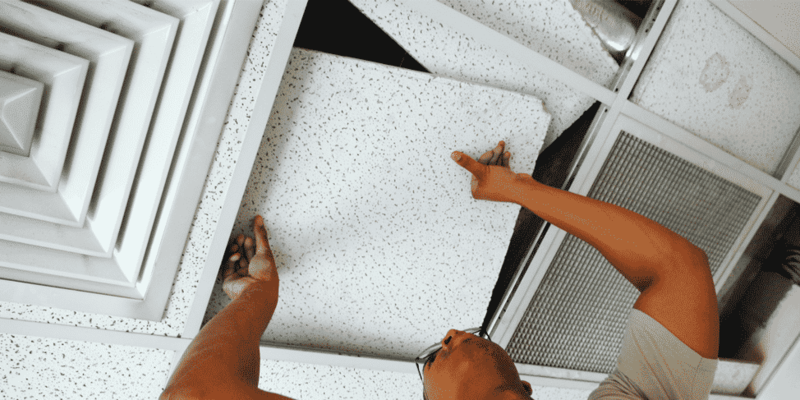 This is why most air vents are located higher on a wall or the ceiling, as cool air falls. Even with the technology advancing, it was yet to be affordable for residential use. Equipment was either too big, or cost too much. In 1929, Frigidaire created smaller home scaled units, which helped expand the development of residential air conditioning. An engineer by the name of Henry Galson created a compact and inexpensive unit in 1947. He also produced and sold over 47,000 units. By the 1960’s most homes had air conditioning. Today, 47 percent of all household energy consumption is from air conditioning. Even today, heating and air conditioning technology continues to improve. With smart thermostats and more efficient units, Benson’s provides customers the ever-improving luxury of HVAC. 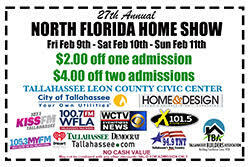 Once again, Benson’s HVAC will be participating at the North Florida Home Show! This annual event will be showcasing the best in home services, including Benson’s award winning HVAC service. This will be a wonderful opportunity for businesses and homeowners to connect with, and learn about exciting industries. New Homes, remodeling, lawn care, pools, appliances, floors, HVAC, and more will be on display. There will be new technologies on display, as well as new businesses to discover. Looking to replace or repair your HVAC system? Benson’s will be there to answer all of your questions and get to know you. If you’re looking to upgrade your home, make small improvements, or even if you just purchased a home the North Florida Home Show should be on your calendar. The convention will be held at the Donald L. Tucker Civic Center on February 9th – 11th. As a thank you to all our loyal customers and potential new customers, Benson’s is offering a coupon for the event. You can print out the coupon found below for a reduced entry price to this exciting event. Printing Directions: Right Click the image above and select “Open Image in new Tab”. In the new tab at the top of your browser select “File” then “Print”. Carbon monoxide (CO) is a colorless, odorless, tasteless gas that is produced by the incomplete combustion of fuels such as wood, natural gas, gasoline, diesel, kerosene, coal and charcoal. It is caused by lack of oxygen or a disruption in the burning process. Household appliances such as your furnace, water heater, stove, space heaters, charcoal grill and gas dryer can be sources of carbon monoxide, especially if they are not in good working condition or have been installed improperly. Vehicle exhaust fumes from attached garages, as well as improperly operating fireplaces, also can become carbon monoxide hazards, particularly if your home is well-sealed for energy efficiency. 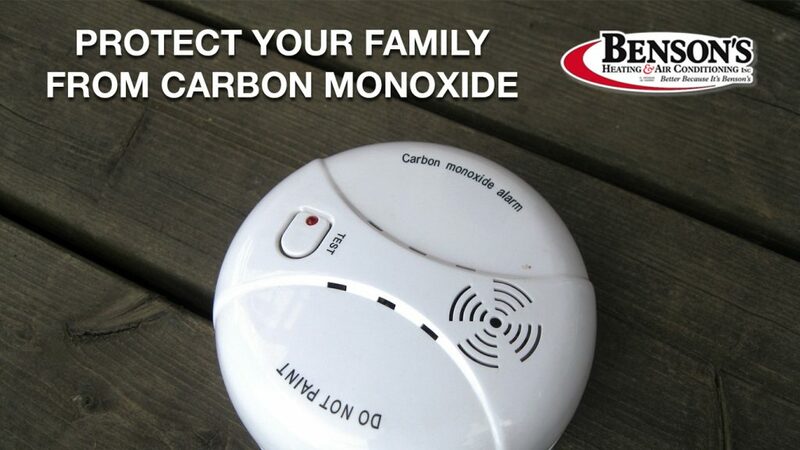 Carbon monoxide can be an invisible threat to your family’s health and safety. Though more commonly associated with fires and automobile emissions, carbon monoxide poisoning can accumulate in any home unless certain precautions are taken. Home heating systems represent only 5% of potential carbon monoxide sources. Though the amount of carbon monoxide produced is not substantial, it is important to schedule annual maintenance visits by a qualified technician to make sure all combustion appliances are operating properly and all chimneys and vents are free from obstruction. The best method of detection is to use a carbon monoxide detector in your home. A carbon monoxide detector is a device very similar to a smoke alarm. It monitors the air for carbon monoxide and sounds an alarm if a specific level is detected. Ideally, you should have one detector adjacent to every living area in your home. Carbon monoxide detectors are most effective when used in combination with a Energy Savings Agreement For more information on how to schedule regular maintenance for your furnace or about purchasing a carbon monoxide detector, just give us a call or visit our website www.bensonshvac.com to place your next visit. Unfortunately, the symptoms are easily overlooked because they are often flu-like. With mild exposure, most people experience headaches, fatigue and nausea. Medium exposure can cause a severe throbbing headache, drowsiness, disorientation, confusion and an accelerated heart rate. Extreme exposure can lead to unconsciousness, convulsions, cardiorespiratory failure, coma and possibly death. What can be done to protect our home from the dangers of carbon monoxide? There are several measures you can take to reduce your risk of carbon monoxide poisoning. Because vehicles are a major cause of carbon monoxide poisoning, always back your car out of the garage to let it warm up. Never leave it running in the confined space of a garage, particularly if the garage is attached to the home. The same holds true for lawn mowers. Never use ovens or grills for heating devices. Home heating systems represent only 5% of potential carbon monoxide sources. Though the amount of carbon monoxide produced is not substantial, it is important to schedule annual maintenance visits by your qualified Bensons technician to make sure all combustion appliances are operating properly and all chimneys and vents are free from obstruction.